This beautiful wedding took place at the Fountaingrove Golf Club in Santa Rosa. A traditional Indian wedding ceremony was followed by a traditional American wedding ceremony. Floral garlands, boutonnieres and bouquets were made up of roses, spray roses, mini callas, and accents of solidaster. I have just updated my website The Wild Orchid (floral design) at http://www.wildorchid707.com please take a moment to check it out. There are a ton of new photos from the past few weddings and events and a whole new layout. Let me know what you think JTheWildOrchid@aol.com Thanks for looking and feel free to contact me with any wedding flower questions you might have. Within this past year we have all felt the harsh setbacks of the struggling economy. No matter who you are and where you are from we are all trying to find ways to cut costs, reuse what we have and all around save money. The Wild Orchid takes pride in making its wedding services available to all types of clients (from weddings, weekly accounts, special events and so on) and all types of budgets. These days weddings can cost more than expected but there are many ways for you to have an incredible wedding on a fixed budget. When meeting with your wedding florist/floral designer don’t be shy on asking what could be done to make the cost more efficient. I would like to share with you ideas I share with my clients. Since flowers only last for so long I try and encourage brides to use/reuse the wedding flowers as much as possible during the event. 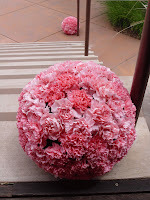 Here are a few tips and ideas you should consider when making your wedding flower plans.